In February, Jeff Lemirequizzed his comic book industry BFF Matt Kindt on Dept. H, the latter’s new series about a murder in a deep-sea research facility. 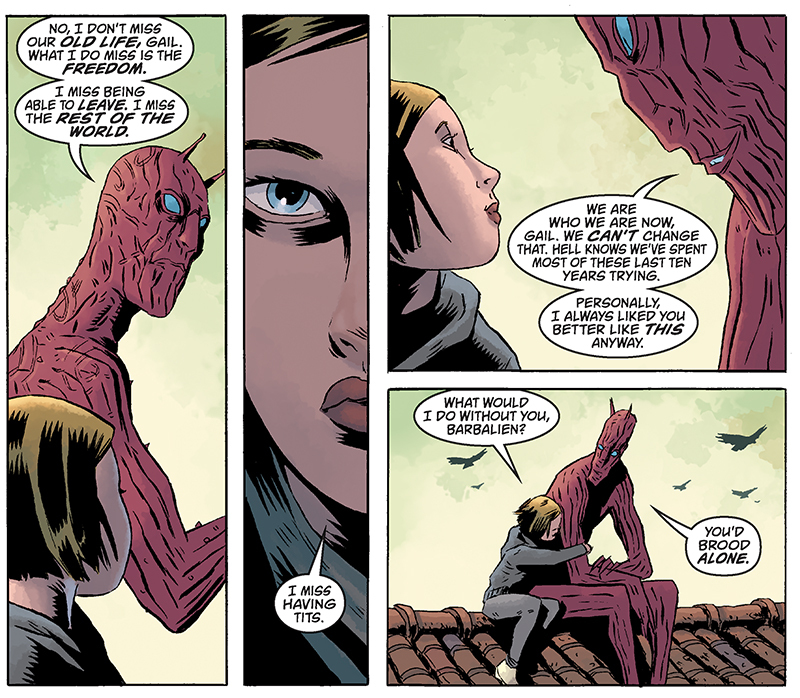 Today, Kindt flips the tables to interview Lemire on Black Hammer, a reflection on Silver Age superheroes filtered through the author’s melancholic, introspective vision that anchored indie benchmarks like Essex County. Pencilled by Dean Ormston (Lucifer), the first chapter introduces a group of Greatest Generation pulp icons mysteriously stranded on a farm. Like Kindt’s analysis of Jacques Cousteau-era wonder and literary adventure in Dept. 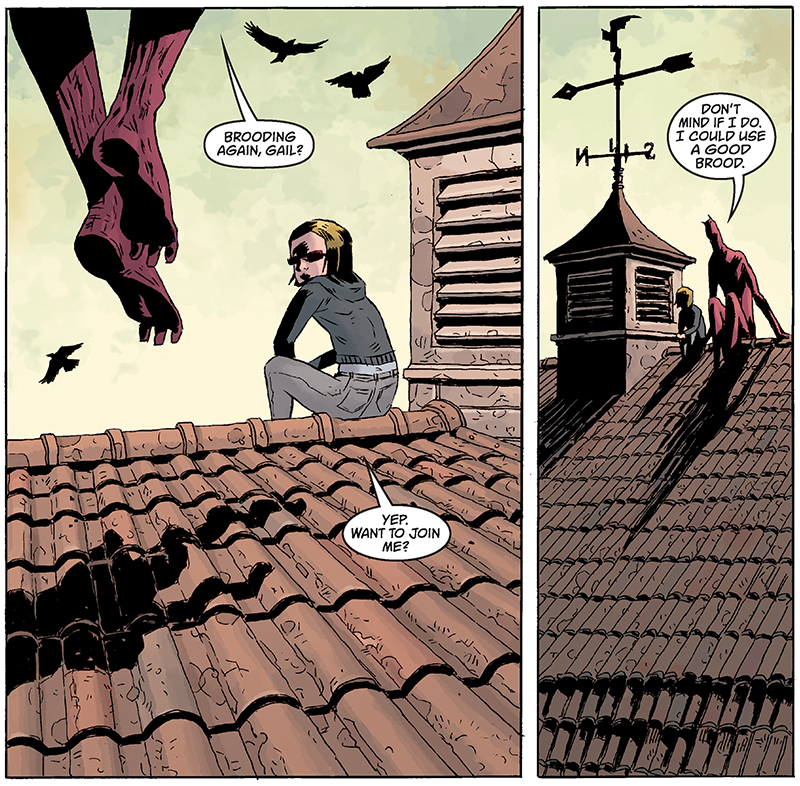 H, Black Hammer pays deep homage to yesteryear inspirations while innovating with nuanced skill. 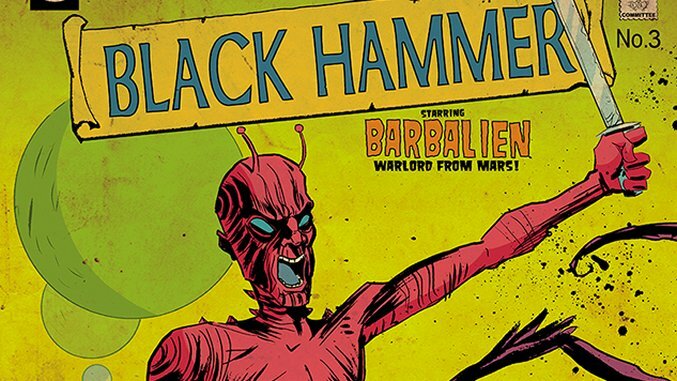 With its first issue out on July 20th, Black Hammer offers another striking take on genre fiction from one of the most progressive voices in the comics medium. Check out the insights Kindt mines from Lemire and this passion project from the exclusive interview below. 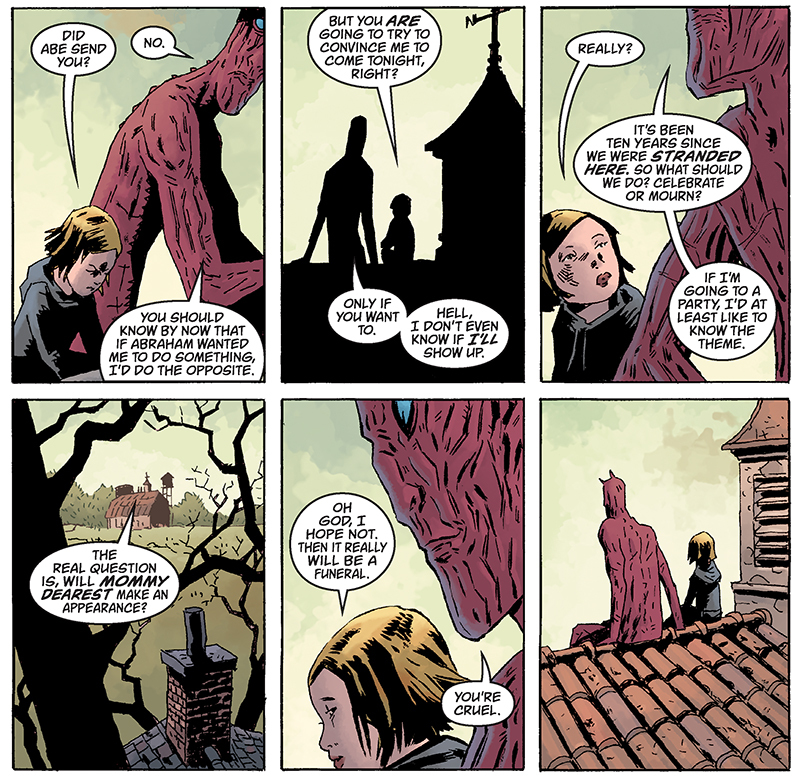 Matt Kindt: When you told me about the idea for Black Hammer a few years ago, I thought it was going to be my favorite thing you’ve ever done. Having read the first few issues…it is my favorite thing. How long had you been kicking this idea around and what was the inspiration for it? Jeff Lemire: I actually came up with Black Hammer and started working on it (designing characters, etc.) back in 2008. I had just finished Essex County and this was really me taking my love of superheroes and channeling it through the rural setting and aesthetic of Essex. I pitched it to Diana Schutz, who was with Dark Horse then, and she loved it. 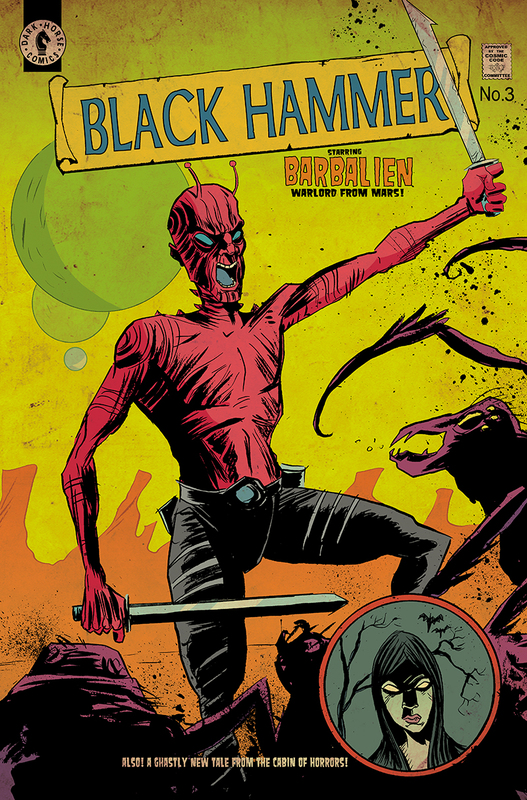 At the same time, Sweet Tooth took off at Vertigo, so I had to shelve Black Hammer. It sat on the shelf for a long time, but I never stopped thinking about it. With me drawing other things now, I knew if I ever wanted to do it, it would have to be with another artist. I remember asking you to draw it at one point. Anyway, I have always loved Dean Ormston, and he and I met in Leeds a few years ago. I thought his style would bring something really unique to it. I went back to my old pitches and documents and started reworking things, updating them, etc. Dean started drawing the book last year, but then ran into some pretty serious health problems. So the book was put on hold again. Thankfully he’s healthy again and back to work and I’m pretty excited to finally be putting Black Hammer out. I think you’re probably right, it might be my favorite thing I’ve ever done, too. It perfectly combines my indie work with my superhero stuff. Kindt: Your love of superheroes as a genre comes through every pore of this book. What were the first superhero books you read? Where’d you get them from and how old were you? Lemire: The first comic book I ever remember reading was a DC digest that reprinted some Justice Society stories from the 1970s by Paul Levitz and Joe Staton. My mom bought it for me at the grocery store. I was probably five or so. And it never stopped. DC’s Who’s Who also had a huge impact on me. It introduced me to the massive library of DC characters and also a wide variety of artists. That and Crisis on Infinite Earths both came out in 1985 when I was nine. They are probably the two biggest influences on my life and on Black Hammer. Kindt: How has it been working with Dean? Is his history with comics helping to inform the series from a visual perspective? I’m seeing echoes of old comics I love even in the page layouts and panel grids. Lemire: Dean is a gem. I fell in love with his work when he was doing Books of Magick: Life During Wartime at Vertigo. (It’s a criminally underrated series and a GREAT Zatanna/Hellblazer story by the way). His stuff is so unique and bold. It’s cartoony, but also really dark and sophisticated. I love it and I was excited to see superheroes filtered through it. There are echoes of various eras of superhero comic history in Black Hammer. You can see influences of stuff from the Golden Age right up to Watchmen in it for sure. Kindt: Barbalien? Maybe the best character ever. Any chance we’ll be seeing any extended or spinoff-style full-length stories about him and the rest of the crew before they ended up on the farm? Lemire: We’ll get to see a lot of each character’s past in the actual series. There will be a lot of time jumps. Barbalien is also my fave. Or maybe Golden Gail. It’s hard to pick.